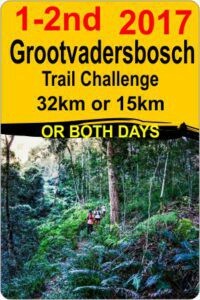 A magical 2 day trail run in the exquisite Grootvadersbosch Nature Reserve & Conservancy, 22km from Heidelberg in the Cape, highly rated by seasoned trail runners. Mountain trails lead you through a fairyland of indigenous forests; giant Redwood tree forest; endemic fynbos and lush river valleys and streams. Rated as fairly strenuous with 95% single track with a great variety of terrain. Undulating climbs, reaching mountain ridges with views towards Barrydale and winding back down into lush valleys and kloofs where you can quench your thirst in the pure sweet mountain water on route. This reserve is one of 8 World Heritage Sites with a highly protected fragile eco system; protected by Cape Nature and the Boosmansbos Conservancy. The name Boosmansbos is derived from that of an angry hermit who lived in the forest in the early 19th century. Boosmansbos was proclaimed a Wilderness Area in 1978 and has managed to maintain and protect its natural system and pristine environment. A percentage of the fees from this event is put back into the Conservancy for alien vegetation management. Dry, cold during the night and warm during the day.